EsriA map of income disparities in the New York City area. 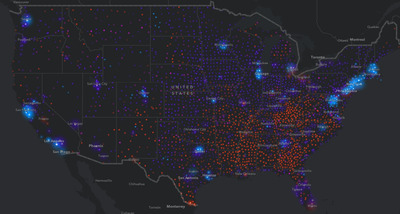 In the United States, your location is tied to how much money you can earn. Wealth is increasingly concentrating in urban centres like San Francisco, Washington, DC, and New York. 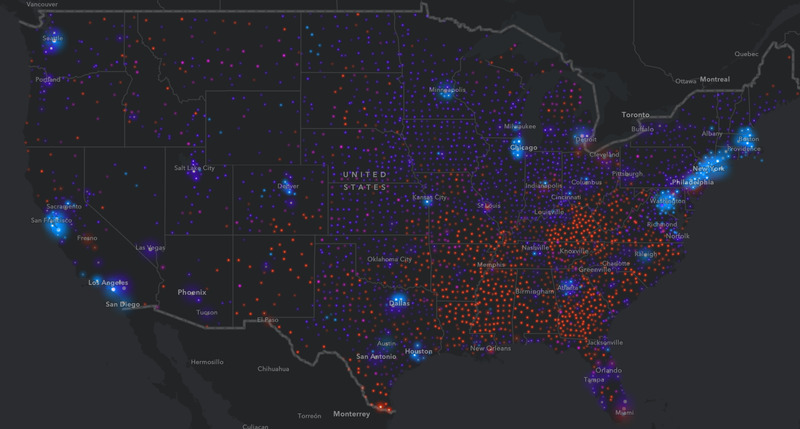 A new interactive map – which plots average incomes in counties across the US – highlights this modern reality. 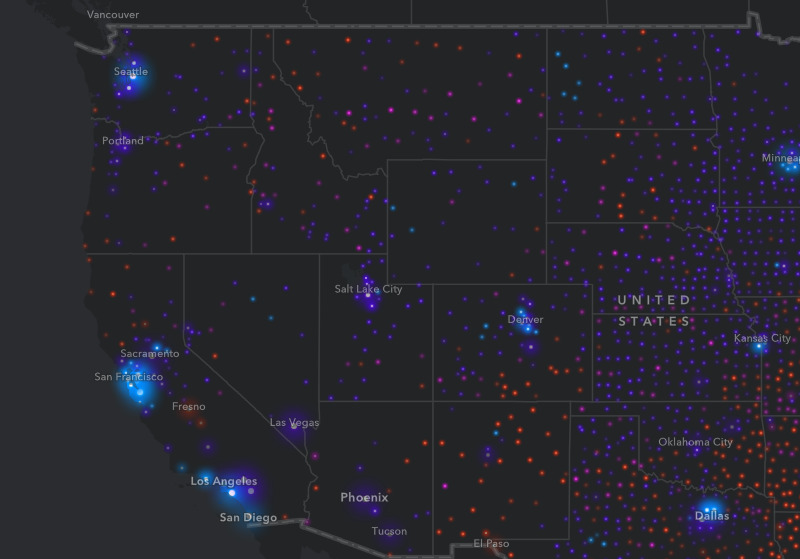 Developed by the mapping-software company Esri, the tool indicates these income brackets with four different colours. 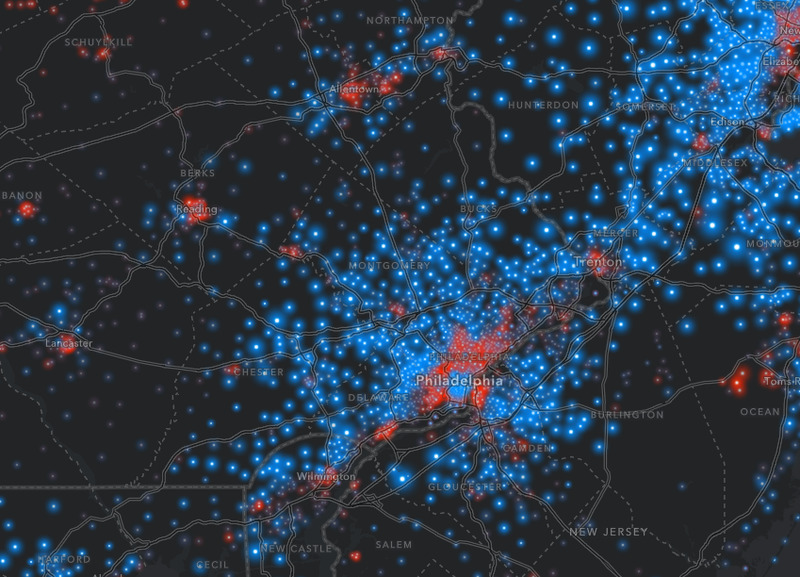 The blue dots represent areas where the typical household makes at least $US100,000 per year; purple is $US50,000 to $US100,000; pink is $US25,000 to $US50,000; and red is less than $US25,000. Larger circles mean more households with a particular salary range. The project explores patterns of wealth and poverty within American cities and the country as a whole. Check out the data below. As you can see in the map below, many people in the bright blue urban centres, like Los Angeles and Washington, DC, make over $US100,000. 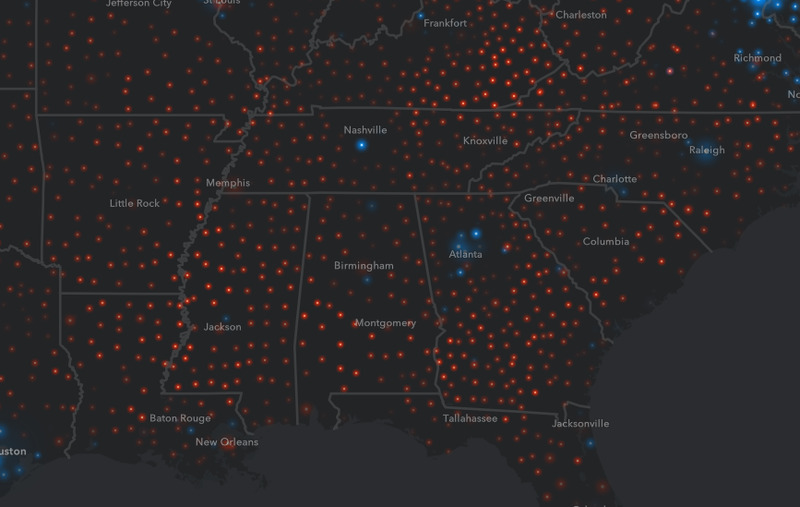 To create the map, Esri used US Census data. EsriMansions in Beverly Hills, Los Angeles (left); cheek-by-jowl bungalows in South Los Angeles (right). A closer look at individual cities shows economic disparities between neighbourhoods. EsriA wealthy Detroit suburb (left); vacant lots not far from GM’s Detroit-Hamtramck Assembly Plant in Detroit (right). 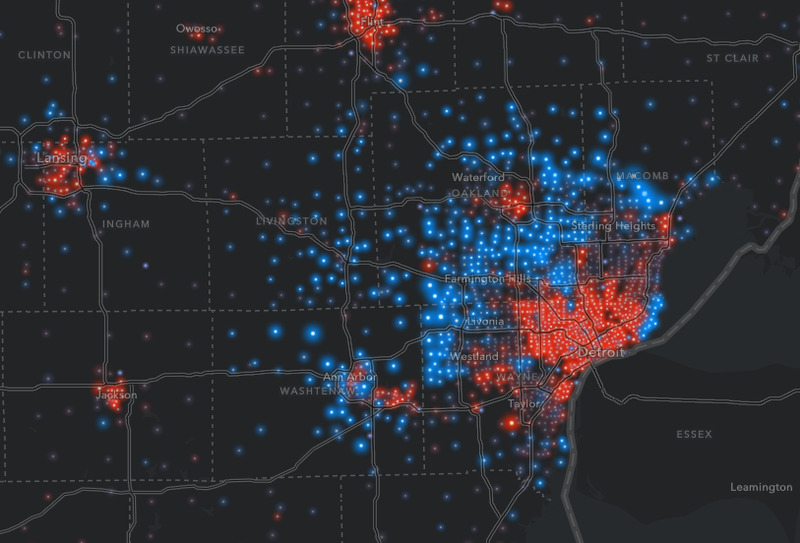 Detroit, a city that suffered major manufacturing job losses in the ’70s and ’80s, has a large income disparity between downtown and outlying suburbs. 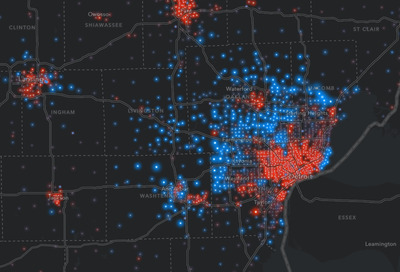 EsriAn income map of Detroit, Michigan. More than a quarter-million Detroit residents live below the poverty line, according to the US Census. 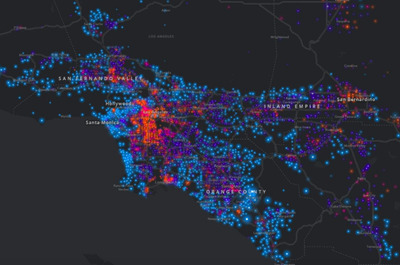 Similarly in LA, economic opportunity is spread unevenly across the city’s geography. EsriAn income map of Los Angeles. Wealthy households are centered in coastal areas, like Hollywood and Santa Monica, and the hills overlooking the city. Low-income parts of LA are downtown and to its south, in the San Fernando Valley, and in the San Bernardino area east of the city. Manhattan neighbourhoods are mostly rich except for parts of the Lower East Side and the northern part of the island. 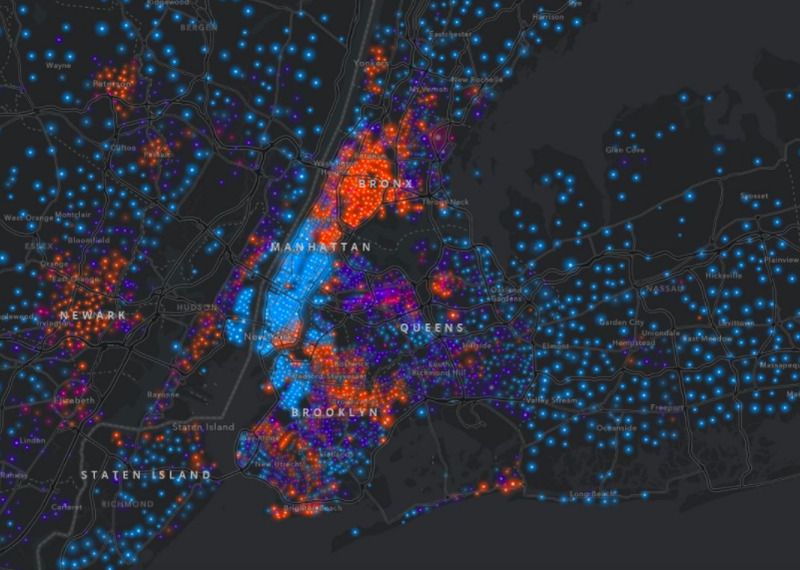 EsriAn income map of New York City. Gentrification, particularly in Brooklyn, has raised income levels in some NYC neighbourhoods in recent years. Some Philadelphia neighbourhoods, like West and North Philly, grapple with extreme poverty. 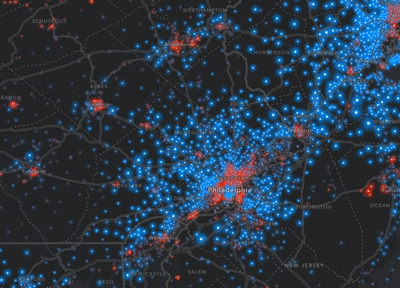 But portions of its urban core, like Center City, are also wealthy. EsriAn income map of Philadelphia. 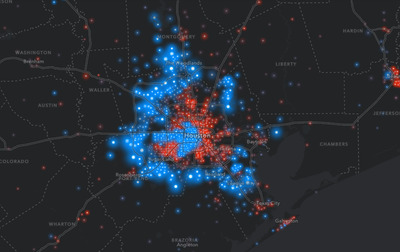 Like Philadelphia, Houston has an outer ring of affluent suburbs and pockets of rich neighbourhoods downtown. EsriGracious homes near Rice University in Houston (left); modest garden apartments in Houston’s Gulfton neighbourhood (right). These neighbourhoods — such as Midtown and West University Place — extend to the west and south. EsriAn income map of Houston, Texas. EsriAn income map of the East Coast. … and the West Coast. San Francisco, California glows a brighter blue than any other city on the map, indicating that a large number of households make over $US100,000. EsriAn income map of the West Coast. 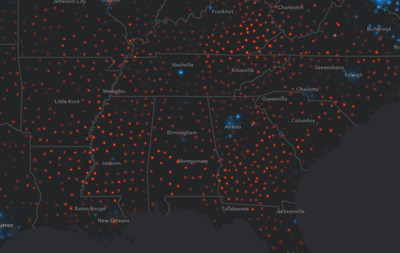 The map’s snapshot of Southern states is much different, as shown via the red dots. In most Southern counties, over a quarter of households earn less than $US25,000. EsriAn income map of the South. 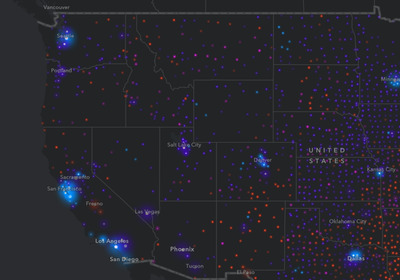 Esri’s tool reveals that income disparities are both real and getting more extreme. It also suggests that the modern economy leaves behind large swaths of the US. EsriLakefront apartments on Chicago’s Gold Coast (left); houses and vacant lots in Englewood, south of the Loop in Chicago (right).